The shipping container, the vessels that carry them and the land vehicles that carry them represent a revolution in the way cargo gets moved across the world. The full impact of that revolution is still being felt. The one thing that is certain is, that like it or not the world is going to be more connected than it has ever been in history as getting stuff from point “A” to point “B” has never been cheaper. To understand the full impact of the revolution We need to start at the beginning. For most of history the way a ship was loaded cargo did not really change very much. Loading a ship was backbreaking labor over gangplank or lifted from a lighter onto the ship with a capstan. This limited the size of what could be put on board. For most of history most cargo vessels were not much different than this one. Whatever they were called they were going to be about 500 tons and maybe 150ft or 50m long. This is about the optimum size for a vessel that had to make a living. Warships were larger and ships that were essentially warships that carried cargo, such as an East Indiaman were larger, but that was due to the nature of the voyages and the likelihood of encountering armed opposition across the world. In the mid 19th Century the size of ships went up somewhat. Routes that were essentially safe were more common and ships no longer had to carry full loads of artillery to protect themselves. Also, with the advent of the steam engine, shoreside cargo handling was easier and it was possible to load more cargo into a vessel. So, ships grew in size and the variety of cargos increased as world trade became cheaper. Ships also became tailored to certain routes and trades like the China clippers for the tea trade. Throughout the 19th Century the steam engine improved until the triple expansion engine was developed and installed in a ship in 1881. Everything was still handled with winches and on the backs of the stevedores who would carry the cargo up a gangplank and into the hold. Here’s a post about that important cargo, coffee. The triple expansion engine was reliable enough that sails and rigging were no longer needed ships settled into a design that would more or less remain unchanged for 70 years from the 1880’s to the early 1970’s. These ships would all be from 5000 to 8000 tons, have a three island cabin structure and deck cranes to load the cargo. The ship’s size didn’t change very much because the cargo was still loaded break bulk as individual pieces along with some bulk cargo. The economics favored the smaller vessels because even if a larger vessel was possible and the liners showed that larger vessels were easily built they couldn’t be loaded economically by the methods used. As it was, the loading of ships required vast port facilities in places like NYC. Here are some videos showing how things were done from the late 19th Century until the 1970’s more or less. The problem with doing things this way is that it is both time consuming and very, very costly as every load has to be unloaded and loaded, sometimes several times with all the opportunities for shrinkage and breakage that that represents. Note the small container in the last video. This would be the kind of box that would change everything. In the mid 1950’s Malcom Mclean was looking for a cheaper way to move truck trailers. Now truck trailers and railcars had been loaded on ships before, but because you were carrying the entire vehicle this was not really efficient. So the transport of railcars was limited to the Seatrains line from NYC South. Mclean took the movement of trailers a step further. He was hardly the only one looking into the concept of containerization as many of the railroads were looking into the same thing. The problem though was that each of the various competitors wanted to maintain control of their systems while trying to become the standard. That didn’t help matters because each of them had problems and were not compatible with each other. Mclean’s brilliance was to offer his system as an open source to the ISO. Which meant that anybody could use it and that anybody using Mclean’s system could be sure that their containers would be transportable on just about anybody else’s vehicles. This was huge. Malcom McLean started out as a trucker and built McLean Trucking into one of the largest U.S. motor carriers. He said that during his early days driving a truck, he was frustrated at the slow pace of cargo loading, and began thinking about the time and money that could be saved if an entire truck van could be loaded aboard a ship. Others had placed containers aboard ships previously, but not in a systematic fashion. McLean sold his trucking company in order to comply with regulatory rules, and bought a steamship company so he could put his idea of containerization into play. The Ideal X was first loaded on April 26, 1956, at a small terminal in Port Newark, New Jersey, which at the time was a marginal facility. The vessel then sailed to Houston, with 58 thirty-three-foot containers. Illustrating just how transformative McLean’s innovation was, Port Newark and Elizabeth, New Jersey, are now home to the largest container facilities in the Port of New York and New Jersey. The advent of containerization sped the end of cargo handling at piers in Manhattan, which then was the center of the port’s activity. A photo of the Ideal X is flanked by microfilm of The Journal of Commerce’s early reporting on the Pan Atlantic Steamship Corp.’s vessel. At left is a brief from Feb. 20, 1956, on the successful sea trials of the Ideal X, which had been converted from a World War II oil tanker named Potrero Hills. At right is a brief dated April 27, 1956, the day after the Ideal X’s departure from Newark. With all the talk and focus on disruption and the next big thing to revolutionize the shipping industry, these passages provide a reminder that monumental changes can slip by relatively unnotice. 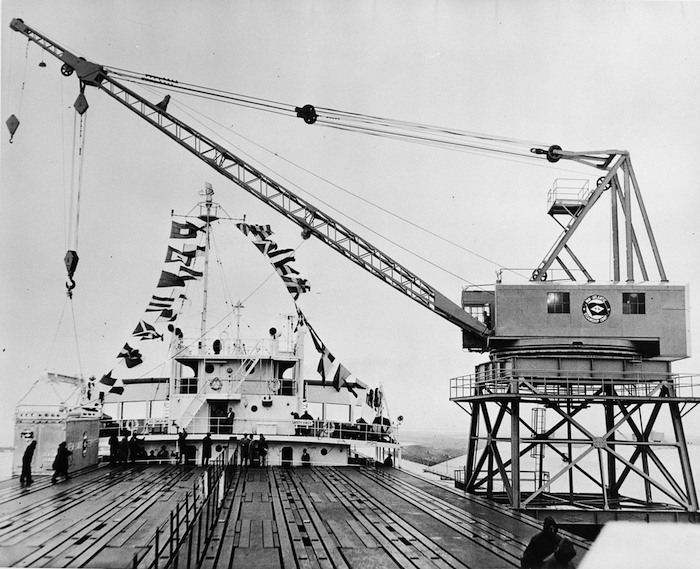 Another shot of the loading of the Ideal X shows its deck, which was placed on top of the tanker’s piping. McLean’s idea was to carry oil on the backhaul from Houston, but this idea was quickly abandoned as he concentrated on moving containers. To secure the containers, which had been reinforced internally to handle the stress of seagoing transport, the containers were designed with steel pegs that fit into openings on the ship’s spar deck. Less than two years later, this securing system was replaced with twistlocks and cell guides when McLean’s company refitted conventional freighters into the first cellular container ships. The revolution began quietly. On April 26, 1956, at a backwater terminal at Port Newark, N.J., a company owned by former trucker Malcom McLean loaded 58 specially strengthened truck trailers on the spar deck of the tanker Ideal X for a coastwise voyage to Houston. Transportation would never be the same. The Journal of Commerce had reported on McLean’s plans, but it didn’t have a story on the loading of the trailers the next morning. The innovation, in fact, wasn’t mentioned in the paper until six weeks later, when McLean sought permission to lease 10 more T-2 tankers for his venture and the railroads objected. 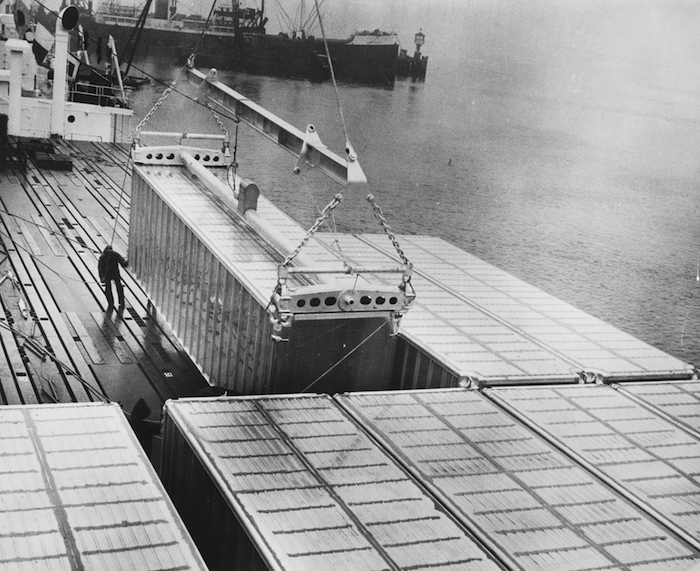 Pan-Atlantic Steamship Co.’s Ideal X introduced containerized shipping in 1956. Many others also were slow to recognize the impact that containerized shipping would have. A few days after the Ideal X first sailed with containers, New York port officials announced plans for a new pier at the foot of Houston Street in Manhattan to handle breakbulk cargo and passengers. Executives of traditional ship lines said intermodalism would never have more than limited application. They cited regulatory hurdles and operational difficulties: Who would want to ship whiskey in containers? some carriers asked. A few carriers immediately realized that their world had changed as dramatically as it did a century earlier in the switch from sail to steam. Other domestic carriers made plans to follow McLean into containerization. In the international trades, the transformation took longer. Grace Line built container ships for the U.S.-Venezuela trade, only to have its first ship stuck in port for 11 months when Venezuelan dockworkers refused to handle containers. 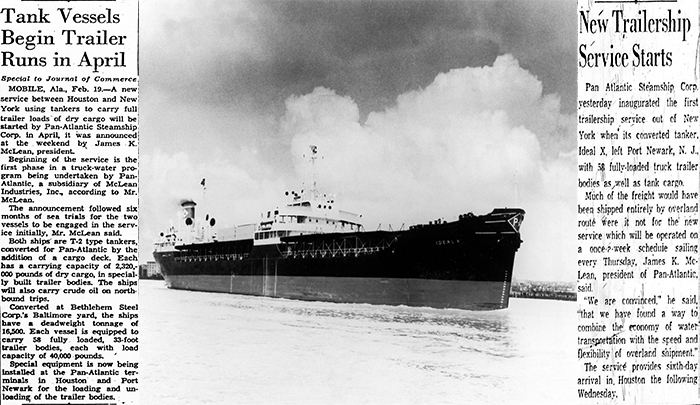 The first container ships didn’t cross the Atlantic until 1966. Containerization drastically reduced longshore employment, made old ports obsolete and opened vast new possibilities for shippers. Cargo locked in steel boxes was less vulnerable to damage and theft. As costs fell and intermodal systems developed, shippers were able to expand their markets and product sourcing. Containerized shipping provided the means for transporting the surge in exports from Asian nations. The JoC provided blow-by-blow accounts of those developments. Some of the biggest battles in the container revolution were waged in Washington. Intermodal shipping got a huge boost in the early 1970s when carriers won permission to quote combined rail-ocean rates. Later, non-vessel- operating common carriers won a long court battle with a Supreme Court decision against contracts that attempted to require that union labor be used for stuffing and stripping containers at off-pier locations. For carriers, containerization made a capital-intensive business even more capital-intensive. It hastened a shakeout of liner operators, many of which were unable to understand their costs or properly price their services. Storied names such as United States Lines, American Export Lines, States Line and Pacific Far East Line faded into history. The consolidation has continued, with acquisitions such as A.P. Moller’s purchase in 1999 of the international services of Sea-Land, the company McLean founded. Now a container could be transported from point “A” to point “B” on ships, trains and truck and never have to be loaded or unloaded between those points. A container can be unloaded from a ship far faster than a load of boxes or bails and it can be kept locked. What it all adds up to is more or less an order of magnitude reduction in terminal costs. Terminal costs that represent the lions share of shipping things overseas. Here’s some links. The impact in NYC was almost immediate and huge. When I moved to the area as a child, the piers and terminals were all still active and operating. By the next seven or eight years, say 1975, all the terminals had closed and many of the piers had been the victims of arson. Likewise the car floating of railcars to ships for unloading also disappeared. The amount of cargo into the Port of NY probably never declined but the container port at Newark could handle all the cargo that had come into the massive port operations all by itself. The ships themselves also got larger. Where 10,000 tons was large, now container ships are taking advantage of the economies of scale to get ever larger. They have reached sizes that once were reserved for the largest oil tankers. Still these large ships can be unloaded in about a day and turned around and moving very quickly. The only limit to size right now seems to be the strength of steel and perhaps more importantly the shipping companies ability to pay for the ships. It’s fashionable to talk about disruptive technologies as high technology. Yet a more or less simple steel box may be one of the most disruptive technologies of all time. The ability to move goods faster and easier than heretofore had even been possible probably has had more to do with the shape of the last 30 years or so than the internet. It’s easy to ignore logistics, but everything ultimately relies on logistics and getting things where they need to be. The better the logistics function the better the society can reach out an prosper. Which makes the steel box a very good thing. Here’s some books for further reference. Need a picture of a modern ship stacked with over 10 containers wide and almost 10 containers high, they are an awesome sight on the ocean. Do they carry containers below decks also? Yes they do. The big ships don’t port NY yet and I don’t get down that far that often. That pic was just taken during a visit to FT. Hamilton’s little museum and getting lucky.